Place raspberries and water in a blender and blend until smooth. Pour about 2 tablespoons of raspberry puree into each cup, saving the remaining puree for later. Place cups in the freezer for 30 minutes. 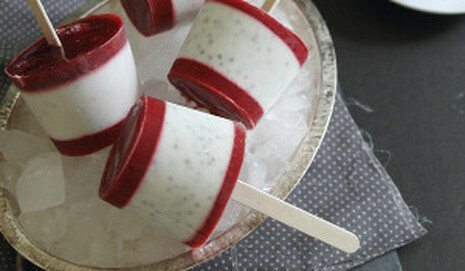 Whisk together the coconut milk and chia seeds in a small bowl. Remove the cups from the freezer and distribute the coconut milk mixture evenly among the 6 cups. Return cups to the freezer for another 30 minutes. Remove cups and place a popsicle stick in the middle of each cup, return to freezer again for another 30 minutes. Peel the paper cups off before serving.